What are you doing to elevate your social media game? 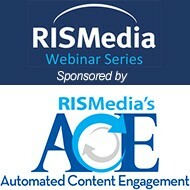 From branding your business pages to generating leads, RISMedia's latest webinar—happening Wednesday, June 20 at 3 p.m. EST—will provide best practices and social media solutions that work! With a spotlight on RISMedia's popular social scheduling service—Automated Content Engagement (ACE)—"Mastering Social Media: Tips and Tools That Work" will be moderated by Sherri Johnson, CEO/founder of Sherri Johnson Coaching & Consulting and a national speaker for Homes.com. Panelists include Pam Charron, broker associate/REALTOR® at Berkshire Hathaway HomeServices Florida Realty; Amy Waugh Curry, REALTOR® at Berkshire Hathaway HomeServices New England Properties; Brenda Noffert, associate broker at Better Homes and Gardens Real Estate Alliance; and Ron Rocz, broker/owner at RE/MAX Nexus. "Social media is a key part of our business and ACE makes it really simple," says Curry. Read testimonials from Curry, Noffert and others, as well as learn how to take advantage of a 14-day free trial, over on RISMedia's ACE site. The webinar is FREE, but space is limited. Be sure to register and reserve your space today!